A reverse triathlon is the best way to get into the sport. Athletes start on Seco Blvd. (south side of the Rose Bowl) and run (1) loop around the Rose Bowl. There is a slight incline for the first part of the run, and then a slight downhill as runners return to the transition area to get on their bike. The bike is (3) loops around the Rose Bowl. There’s uphills, downhills and best of all, no cars! After the bike portion, athletes will run down to the Rose Bowl Aquatic Center, jump in, and swim (3) laps in the pool. This race is perfect for new triathletes and seasoned competitors. 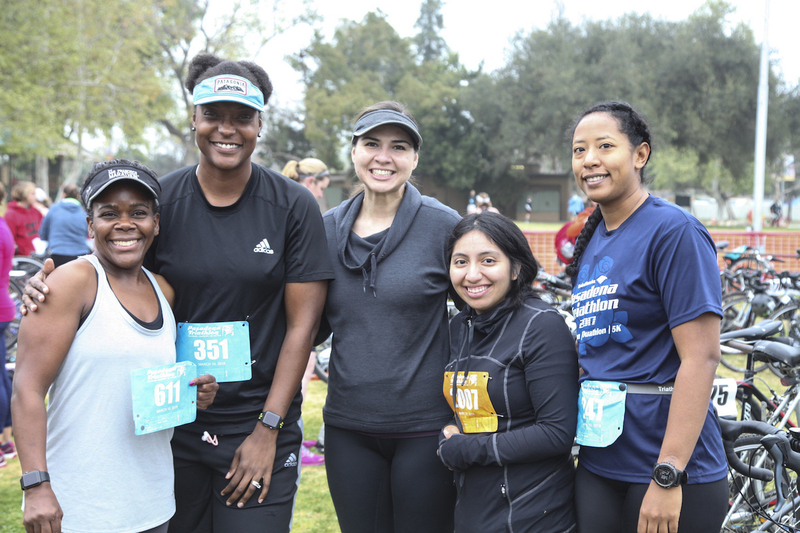 Make sure to check out the triathlon clinics hosted by the Pasadena Triathlon Club to help you prepare for race day and get all your questions answered. View the run/bike course map HERE. View the swim course map HERE. SWAG – 2020 SWAG to be revealed! 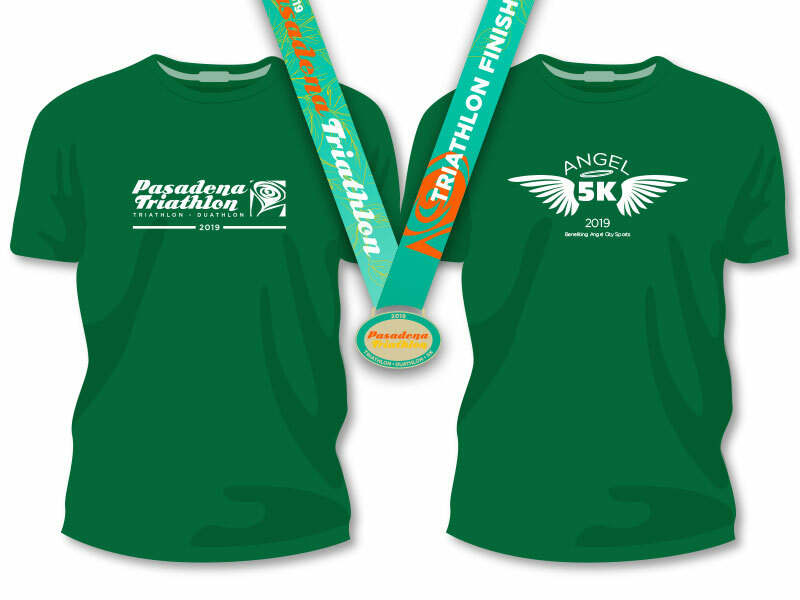 Every participant will receive a finisher medal, race shirt, 1 cold beer, and access to the post-race festival! Let’s face it, the duathlon is actually harder than the triathlon with two 5k runs hugging a 15k bike ride. A duathlon cuts out the swim and is a favorite among people looking to do something different, without getting their hair wet. Athletes start on Seco Blvd. (south side of the Rose Bowl) and run (1) loop around the Rose Bowl. There is a slight incline for the first part of the run, and then a slight downhill as runners return to the transition area to get on their bike. The bike portion consists of (3) loops around the Rose Bowl. Athletes then return to the transition area, drop of their bike, and head out for one more running loop around the Rose Bowl. View the course map HERE. Every athlete needs to bring their own bike. Most types of bikes are allowed, including 10 speed, mountain bikes, time trial bikes. All bikes need to have a hand brakes and a freewheel (no fixies allowed). More rules can be found here. All you need for the swim is a swimsuit, which you can wear under your running gear (or just race in it). After leaving your bike at transition, you will run (with your shoes) down to the pool. You will drop your shoes outside of the pool deck (there is a sign) and then walk quickly to the pool. From there, you’ll jump in and swim three 3 laps. At the end of each lap, you’ll duck under the lane line and swim to the other side. Don’t worry – there are signs and volunteers to guide you along the way. All you need for the run is some running shoes and a good attitude! Note, there is one water station on the run course. The transition area is basically your home base. It’s a large fenced in area where you will place all your race equipment. In the early morning before the race begins, you will enter the transition area, look for your specific age group sign, and place your bike on the rack. We recommend all athletes come to an Intro to Triathlon Clinic to get all your questions answered. These clinics are free and hosted by the experts at the Pasadena Triathlon Club. 01.24.2019 - Free Swim Clinic This Saturday! Get all your questions answered and know what to expect on race day! 12.05.2018 - 2019 Clinics are Posted!